Wooden construction is the most traditional of boatbuilding methods, dating back thousands of years, and there are still several notable examples of wooden superyachts cruising the world’s oceans today. The 38.75 metre Fundamental (ex-Alyssa) is a cold-moulded wooden motor yacht which embraces minimalist beauty. 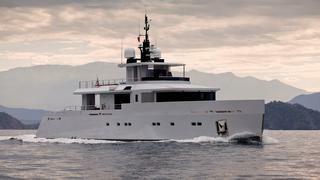 Delivered in 2014 by Turkish builder Tansu, she can accommodate up to eights guests and five crew members. At the request of the owner, she was intended to evoke a casual, beach club feel. The lifeguard huts and laid-back culture of South Beach in Miami inspired the finishing touches of her interior. Her wooden superstructure, reinforced with epoxy, harmoniously compliments her beach house style. Tansu aimed to focus on al fresco entertaining, devoting considerable space to her outside deck and lounging areas. This classic and comfortable design favours simplicity over ornamentation and her light weight means that she can reach a top speed of 21 knots. Wooden construction is the most traditional of boatbuilding methods, dating back thousands of years, and there are still several notable examples of wooden superyachts cruising the world’s oceans today. The 38.75 metre Fundamental (ex-Alyssa) is a cold-moulded wooden motor yacht which embraces minimalist beauty. Delivered in 2014 by Turkish builder Tansu, she can accommodate up to eights guests and five crew members. At the request of the owner, she was intended to evoke a casual, beach club feel. The lifeguard huts and laid-back culture of South Beach in Miami inspired the finishing touches of her interior. Her wooden superstructure, reinforced with epoxy, harmoniously compliments her beach house style. Tansu aimed to focus on al fresco entertaining, devoting considerable space to her outside deck and lounging areas. This classic and comfortable design favours simplicity over ornamentation and her light weight means that she can reach a top speed of 21 knots. 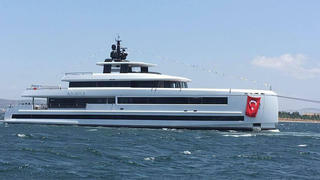 The vast majority of new wooden superyachts are currently being built in Turkey and Mengi-Yay is one of the key players. The 2016 launch Aquarius sports a stylish modern exterior styling by Oğuzhan Güler with an almost vertical prow, which belies the fact that both the hull and superstructure were built from cold-molded, epoxy-laminated timber. 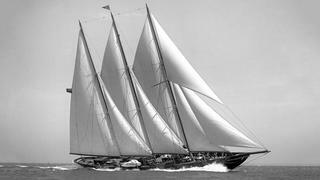 Built by White HW and launched in 1920, the 46 metre gaff-rigged cutter Lulworth is one of the oldest sailing yachts still cruising today. Her mahogany hull is reinforced with steel frames, while both the decks and superstructure were crafted from teak. Lulworth’s has undergone several superyacht refits over the years, the most recent of which was in 2006, and her accommodation can sleep up to seven guests in four cabins. The tri-masted Camper & Nicholsons sailing yacht Creole is widely regarded to be one of the most beautiful classic yachts in the world. 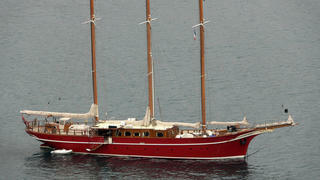 This wooden schooner features an all-teak construction, including the hull, deck and superstructure. Despite her classic styling, this 52.4 metre motorsailer was launched as recently as 2013 by Turkish yard Dream Ship Victory. A 2014 World Superyacht Award winner, Mikhail S. Vorontsov sports a laminated wooden hull and luxurious interiors created by Balk Shipyard in the Netherlands. Accommodation is for ten guests split between five cabins and she boasts a cruising range under power of 2,950 nautical miles at 12 knots. Dream Ship Victory is currently working on an even larger wooden superyacht, the 141 metre Dream Symphony, which is due to launch before the end of this year. Despite her classic styling, this 52.4 metre motorsailer was launched as recently as 2013 by Turkish yard Dream Ship Victory. A 2014 World Superyacht Award winner, Mikhail S. Vorontsov sports a laminated wooden hull and luxurious interiors created by Balk Shipyard in the Netherlands. Accommodation is for ten guests split between five cabins and she boasts a cruising range under power of 2,950 nautical miles at 12 knots. Dream Ship Victory is currently working on an even larger wooden superyacht, the 141 metre Dream Symphony, which is due to launch before the end of this year. Launched in 2004 by American yard Hodgdon Yachts measuring 47.12 metres LOA, Asolare (ex-Scheherazade) was the largest cold-molded yacht in the world at the time. Her 2014-15 refit at Front Street Shipyard in Maine saw her entire hull sanded back and repainted. This Bruce King-designed sailing yacht features interiors by British studio Winch Design with accommodation for up to six guests and five crewmembers. Launched in 2004 by American yard Hodgdon Yachts measuring 47.12 metres LOA, Asolare (ex-Scheherazade) was the largest cold-molded yacht in the world at the time. Her 2014-15 refit at Front Street Shipyard in Maine saw her entire hull sanded back and repainted. This Bruce King-designed sailing yacht features interiors by British studio Winch Design with accommodation for up to six guests and five crewmembers. These days Benetti is best known as the world’s largest motor yacht builder, but that wasn’t always the case. 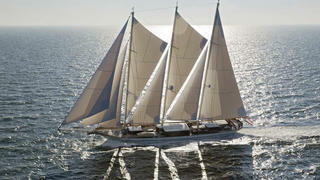 The 1941 launch Francesca Petrarca is proof of the Italian yard’s fine pedigree in building wooden sailing yachts. 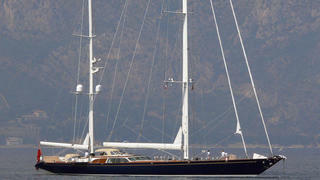 Her oak and pine hull is reinforced with steel, while the teak superstructure matches her decks. This 49.41 metre triple-masted sailing yacht boasts accommodation for up to 11 guests, while twin General Motors diesel engines give her a top speed under power of 12 knots. These days Benetti is best known as the world’s largest motor yacht builder, but that wasn’t always the case. 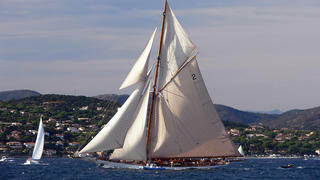 The 1941 launch Francesca Petrarca is proof of the Italian yard’s fine pedigree in building wooden sailing yachts. Her oak and pine hull is reinforced with steel, while the teak superstructure matches her decks. This 49.41 metre triple-masted sailing yacht boasts accommodation for up to 11 guests, while twin General Motors diesel engines give her a top speed under power of 12 knots.